Every November we take the time to honour the sacrifices and contributions of Canada's Service Men and Women. 2018 is an important year of remembrance, commemorating the 100th anniversary of the end of the First World War. From our own backyards in Innisfil to the experiences overseas these two wars had a powerful legacy for everyone involved. Using images from the Innisfil Historical Society's collections and video footage of interviews with local veterans and youth, Our Stories Innisfil has created a virtual exhibit in honour of those that served, suffered and triumphed during the tumultuous times of war. Delve into the stories of wartime with this special feature page: Innisfil Remembers. 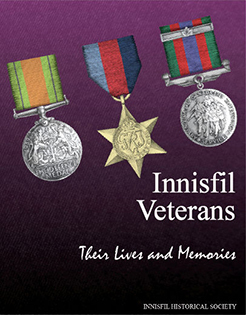 Here you will find links to a variety of materials relating Innisfil's connections to the wars. Explore the experiences of veterans of World War II as they share their memories in their own words. Explore the Digital Historical Collections of the Innisfil Historical Society and the Bradford West Gwillimbury Public Library. You may find portraits of soldiers or postcards from the Front. Browse through the links below to discover materials related to both the First and Second World War. Don't forget to continue your journey by checking out one of these books about war from your local branch of the Innisfil Public Library.